I teased it earlier in the week, and I’m so excited to share this with you! UNFINISHED features Quinn’s POV and is set 10 years before UNSTRUNG. ** It should be released in early January (sooner if I finish editing early). Without further ado, here’s the amazing cover! 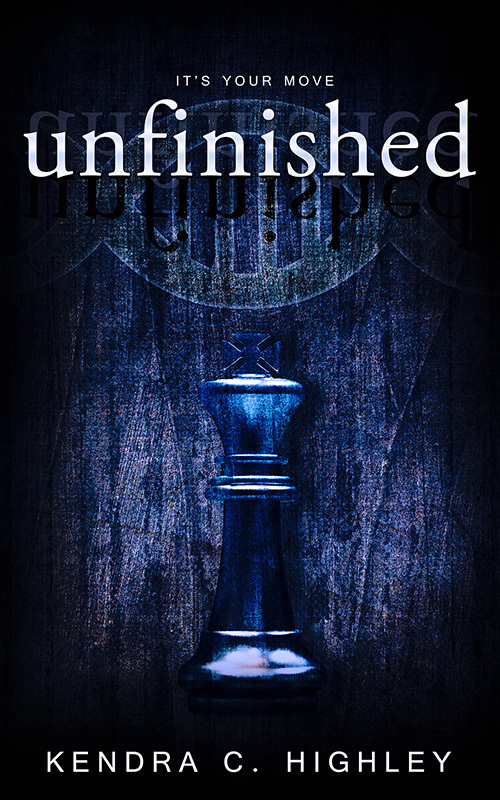 Chess is an important element in the story, so when Glendon at Streetlight Graphics sent me this “draft cover” I wrote back and said, “DONE!” : ) The dark colors and the almost harsh background lend themselves to the story well, too. Finally, I’d like to share a little snippet from the beginning of the novella. Enjoy! Quinn watched the monitor. It’s camera was trained on the prep room where the new K700 prototype was under development. She was only the second model in this line, and the first female. His heart fluttered in excitement. Miss Maren had told him the little girl was going to be his friend. Created specifically to keep him company and learn with him. After spending most of his time in the company of adults—both human and artificial—he could hardly wait to meet her. Lexa. That would be her name. She was still pale, just like the day before and the day before that. He wondered when she would change colors, and what color she would be, but Dr. Mendal had said not to pry, so he didn’t ask. He’d learned that if he asked the wrong questions—or too many in a row—that his curiosity would cause trouble. And pain. The girl stared blankly into space, but he could tell she was afraid by the way her knuckles whitened as she clutched her blanket. Or the way her right eyelid twitched every so often. Being scared was a good sign—it meant she was turning into a person. He immediately flushed, feeling bad. He didn’t want her to be scared, and it wasn’t nice to be glad about it. “She’s…wondering where she is, and why she’s here,” he said after a moment. Even though he was watching her over the feed, he could read her mannerisms easily, which was strange. But if Lexa had been made to be his best friend, maybe that was why he could tell how she felt. The door at the back of the observation lab swooshed open and a pair of high heels clicked toward them. Quinn rounded his shoulders to sink a little shorter. I’m not a threat, I’m not a threat. I’m invisible. Cool fingers tipped with long, pointed fingernails, brushed the back of his neck. A welt rose up on the sensitive skin below his hairline where they scratched. He held very still. Quinn balled his fists around the hem of his T-shirt. Please. Please don’t say no. Miss Maren pinned him with her eyes. Calculating. That was the vocabulary word he’d use. It meant shrewd. Which sounded a lot like shrew. Which meant mean, screechy lady. He bit the inside of his cheek to keep from smiling. It wasn’t a real smile anyway, he reasoned. It would be a nervous “I’m not hiding anything” smile, when all he could afford was a vaguely bored look if he hoped to get what he wanted. Because that’s what Miss Maren was good at. She found out what he wanted, then took it away. Five minutes? That was all? The look on her face, though. She wanted him to argue. If he argued, she could tell him no. “I can be in and out in four, if that’s better,” he said. Right, no touching. Dr. Mendal had told him her immune system was still developing. His germs could hurt her. Inside the clean room, which was just a little hall between the observation lab and her prep room, he pulled a white jumpsuit out of the cubby. It covered him from his neck to his toes and had a hood to cover his head attached to the back. The suit crackled every time he moved. It was polymer based and felt like a trash bag. By now, the little girl was hugging herself and rocking back and forth on her bed. Quinn hurried to don a pair of latex gloves. She would be better if she could just meet him. He knew it. She needed a friend; that would fix everything. He gave a thumbs up to Dr. Martine and the airlocks opened with a clank. When her door opened, she startled, staring wide-eyed as Quinn stepped inside. This entry was posted in Blog on November 14, 2014 by Kendra.